Join Ayamanatara for a hands-on monthly workshop on card reading. Open to all levels of experience and study. Although we will talk about card meanings, patterns, and layouts, our main focus will be on intuition, readings, deepening our experience, and overcoming self doubt. We will also touch on things like multi-deck readings, non-tarot oracle cards, and mixed mediums, depending on the skill and interest level on any given month. Some cards will be available to borrow, but please bring your favorite deck(s)! If there is enough interest, I may designate individual workshops as being dedicated to specific decks, such as Davide de Angelis’ Starman Tarot. While each month will, by necessity, build on previous workshops, each will be designed to be taken as a standalone class. We do ask that you RSVP at least 24 hours in advance so there are enough materials, table space, and chairs for everyone! 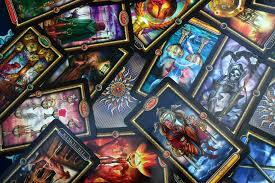 Students who have previously taken Journey the Mystical Tarot can consider this a level 2 or practicum for that class.